Great mother Isis, the goddess of healing and magic, was crucial to ancient Egyptian religious beliefs. She is known today by her Greek name Isis; however, the ancient Egyptians called her Aset. Her name translates to “Queen of the Throne” which is reflected in her headdress, which is typically a throne. Sometimes she is also depicted with the vulture headdress of the goddess Mut, and other times with a disk with horns on the sides, attributed to the goddess Hathor. She took on their headdresses as she assimilated their traits. Isis can also be seen as a winged goddess who brought fresh air to the underworld when she went to meet her husband. Isis was the sister and wife of the god Osiris, ruler of the underworld. It is said that she and Osiris were in love with each other even in the womb. Isis was also the mother of Horus, the protector of the pharaoh. The most famous story of Isis begins when Seth, the jealous brother of Osiris, dismembered him and scattered the parts of his body throughout Egypt. The ancient sacred stories say that the other deities were so impressed with Isis’s dedication to finding her beloved husband, that they helped her revive him. Isis was very important to the ancient Egyptians because she had so many different powers. She was both the protector of women and the bringer of magic. 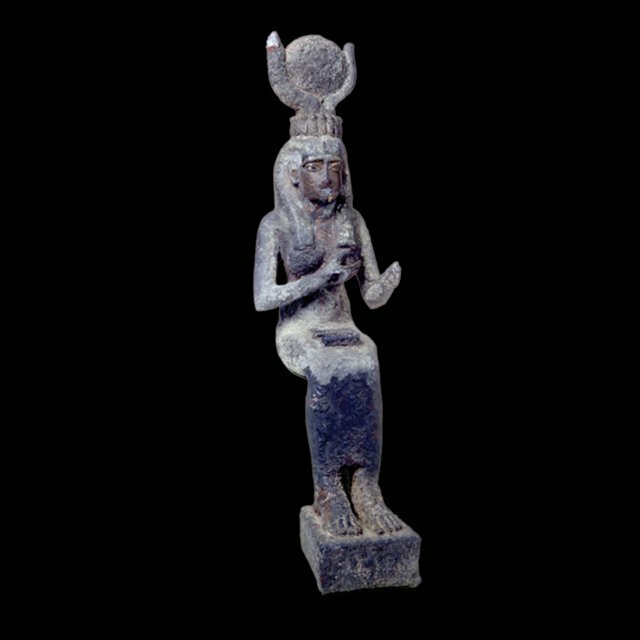 Isis began as a secondary figure to her husband Osiris, however after thousands of years of worship, she was transformed into the Queen of the Universe and the embodiment of Cosmic order. By the Roman period, she was believed to control the power of fate itself. Image: RC 1652 Isis Figure at the Rosicrucian Egyptian Museum.